[From Schroeder 1980:238-239] Subgenus Amaurostoma: eyes smaller, not bordering base of mandible; mandibles long and slender with protrusions at base; labrum mat without long hairs on front border; elytra on base of epipleura without colored markings. O. erythrocephala: Length 6.0-14.0 mm, width 1.5-3.0 mm; very slender; antennae a little shorter than body (male) or much shorter (female), the 3rd segment longer than the 4th, much longer than the scape. Lower lobes of eyes as long as gena; front 1.5X the width of one lobe (male) or almost 2X as wide (female). Head and pronotum densely punctate; pronotum transverse, scutellum large and triangular. Elytra very long (3X head length and pronotum combined), parallel and somewhat cut at ends, densely and grossly punctate, the points partly in lines, rather faint towards ends of the elytra. Lateral parts densely punctate. Hind femora slightly extending over posterior border of first abdominal segment. Hind tibia 2/3 longer than hind tarsae. Body red in color with yellowish pubescence. Antennae black with a dark brown pubescence. Tips of mandibles, anterior and posterior borders of pronotum, scutellum, elytra, and sterna all black with grayish pubescence. Mesepisternum and metaepisternum covered with dense brownish-yellow pubescence. First 3 abdominal segments with a large central black band (reduced in width from 1st to 3rd segment); part of 5th segment blackish. Adults active from late May (males emerge several days before females) to early August in Austria, Germany, Italy, Switzerland, overwinter as larvae in host plant and continue to feed the following spring (Schroeder 1980); similar phenology in North American populations, although may require 2 years to complete life cycle in northern part of range (Schroeder 1980; Rees et al. 1996; Hansen et al. 1997). Smaller eye size, the elytra on base of epipleura without colored markings, and longer more slender mandibles distiguishes members of the subgenus Amaurostoma (of which Oberea erythrocephala is a member) from members of the Old World subgenus Oberea. Features described in General Description (see above) and host plant specificity (Euphorbia rather than woody trees and shrubs) should help distinguish this species from native North American members of the genus in Montana (see Hart et al. 2013 for a list of Oberea species). Native Range: central and southern Europe, Asia Minor, the Caucasus and southwestern Siberia. In Europe, most common in the Balkans, southeastern Austria, parts of Germany and Switzerland (in Switzerland from at least 450 m to 1500 m elevation); rare in Portugal and Spain (Schroeder 1980). 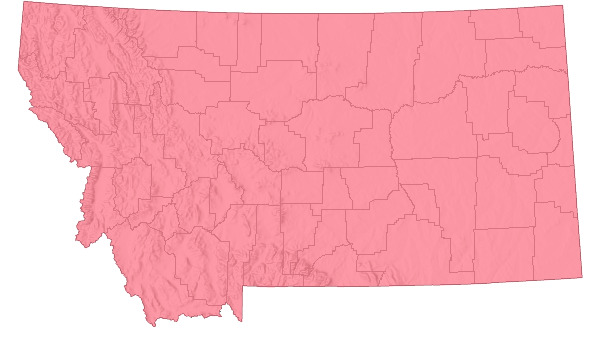 North America: Introduced as a biological control agent against Leafy Spurge (Euphorbia esula complex) in Canada and the US: Oregon and Wyoming in 1980-1982, Montana in 1982-1984. Additional releases during 1988-1996. Established in Colorado, Montana, North Dakota, Oregon, and South Dakota, but failed in Idaho, Iowa, Michigan, Minnesota, Nebraska, Washington, Wisconsin, and Wyoming (Rees et al. 1996; Hansen et al. 1997). Original Montana releases in Gallatin, Richland, and Stillwater counties, subsequently in other counties (Rees et al. 1986; Hansen et al. 1997). Now documented in Montana from at least 24 counties mostly in the western 1/2 of the state, but including Custer, Richland, and Valley counties in the eastern 1/4 (Hart et al. 2013); populations in all of these counties may not be extant or self-sustaining. Uncultivated fields, pastures, rangelands, and cultivated croplands where Leafy Spurge (Euphorbia esula) and related Euphorbia species present; established best in riparian areas with some tree cover (Schroeder 1980; Rees et al. 1986; Rees et al. 1996; Hansen et al. 1997; Lajeunesse et al. 1997). Host plants restricted to Euphorbia. Reported larval and adult host plants in Europe include several species, especially E. cyparissias, E. esula, E. seguieriana, and E. virgata (Schroeder 1980). Adults also feed, girdle, and oviposit on North American exotics of E. amygdaloides, E. cyparissias, E. esula, E. polychroma, E. serratula, and E. virgata; adults rarely feed on the ornamentals E. milii, E. myrsinites, and E. pulcherrima. Larvae develop only on E. cyparissias, E. esula, E. seguieriana, and E. virgata. In feeding trials, larval develpment normal on E. amygdaloides, E. cyparissias, E. esula, and E. virgata, other Euphorbia species ignored, with possible exception of E. polychroma (Schroeder 1980). In transfer tests, L1 instar larvae placed in artificial mines on 24 genera (31 species) of potential host plants developed to L3 instar only on hybrid Chrysanthemum, Euphorbia polychroma, and Lythrum salicaria (Schroeder 1980). On Euphorbia, L1-L3 or L4 instar larvae feed within stem pith before reaching root crown, later instar larvae feed in root crown and upper part of main root; most adult feeding on host plant stems and leaves, less often on inflorescences (Schroeder 1980; Rees et al. 1986). In Montana, beetles reared from E. cyparissias, E. esula, and E. virgata will feed on E. esula (Rees et al. 1986). Biological control agents are most effective when integrated with other biocontrol and traditional methods (Lajeunesse et al. 1997; Lym 2005). This approach applies to use of Oberea erythrocephala for controling leafy spurge. Although this biocontrol agent has potential to greatly depress leafy spurge populations, it attacks only specific biotypes of spurge, which inhibits beetle population growth sufficiently in many areas to greatly reduce its effectiviness. Adult feeding on host leaves and stems does not greatly affect leafy spurge survival. However, girdling and subsequent egg-laying by adult females results in shoot death. Larval feeding in stem pith causes stem death, and larval feeding in root crown and roots greatly reduces the plant's root reserves. Larvae live and feed in host plants with stem diameters >3.0 mm (Rees et al. 1996). 1) Determine beforehand the habitat requirements for biocontrol insects to be used. Avoid sites with high ant and grasshopper populations, and seek areas free from grazing, herbicide or pesticide use. Initial release sites should be protected for up to 10 years, secondary sites need less protected time. 2) Collection should be made with minimum stress to the insects. Beetles can be collected by using a sweep net through the upper portions of leafy spurge plants 8-10 times, then dumping content into a container. 3) Release insects as quickly as possible. If moved more than 80 km or held for more than a few hours, the biocontrol species should be sorted out from other species of arthropods captured during sweeping. Biocontrol insects should be kept cool during transport through use of a cooler with refrigerated (not frozen) coolant packs. 4) Release biocontrol insects during the cool parts of a day by sprinkling over a small area (10-15 square meters) on a leafy spurge infestation of moderate density. Avoid tall, dense stands that may provide too much shade and high humidity. 5) Permits are required to transport biocontrol insects across state or provincial borders; in Montana, permits can be obtained from the Montana Department of Agriculture. Hansen, R.W., R.D. Richard, P.E. Parker, and L.E. Wendell. 1997. Distribution of biological control agents of leafy spurge (Euphorbia esula L.) in the United States: 1988-1996. Biological Control 10:129-142. Lajeunesse, S., R. Sheley, R. Lym, D. Cooksey, C. Duncan, J. Lacey, N. Rees, and M. Ferrell. 1997. Leafy spurge: biology, ecology and management. Bozeman, MT: Montana State University Extension Service Bulletin EB-134. 25 p.
Lym, R.G. 2005. Integration of biological control agents with other weed management technologies: successes from the leafy spurge (Euphorbia esula) IPM program. Biological Control 35:366-375. Rees, N.E., R.W. Pemberton, A. Rizza, and P. Pecora. 1986. 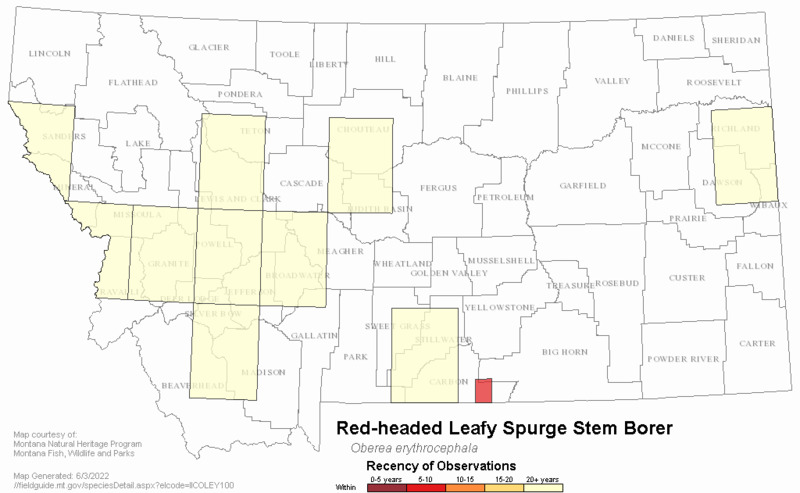 First recovery of Oberea erythrocephala on the leafy spurge complex in the United States. Weed Science 34:395-397. Rees, N.E., R.W. Pemberton, N.R. Spencer, P.C. Quimby, Jr., and R.M. Nowierski. 1996. The spurges pp. 155-186 In: N.E. Rees, P.C. Quimby, Jr., G.L. Piper, E.M. Coombs, C.E. Turner, N.R. Spencer, and L.V. Knutson (eds). Western Society of Weed Science. Bozeman, MT: Montana State University. Shroeder, D. 1980. Investigations on Oberea erythrocephala (Shrank) (Col;Cerambycidae), a possible biocontrol agent of leafy spurge Euphorbia spp. (Euphorbiaceae) in Canada. Zeit. fur ang. Ent. 90:237-254. Web Search Engines for Articles on "Red-headed Leafy Spurge Stem Borer"